The Big Guy and I were able to catch a couple of football games from my Alma Mater, Hardin-Simmons University. 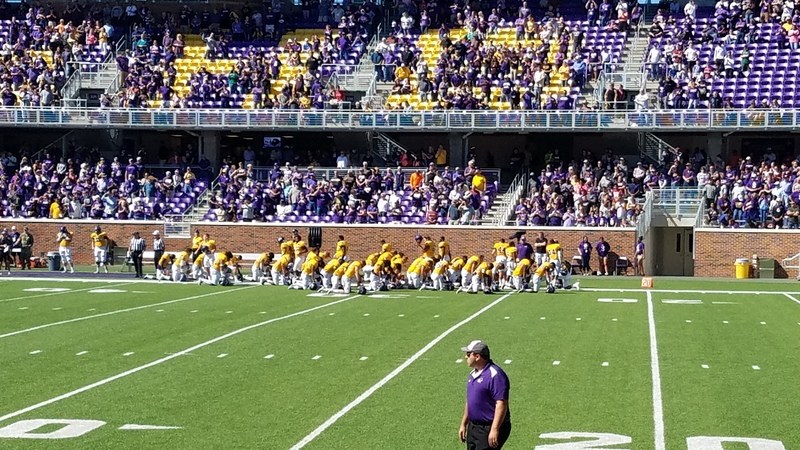 One of the things that impressed me was that both times the home teams took a knee in prayer before the game. (Game 1 Hardin-Simmons. Game 2 University of Mary-Hardin Baylor, pictured below.) Also during both games the teams, Hardin-Simmons, Howard Payne & UMHB stood during the national anthem. University of Mary Hardin-Baylor Crusaders praying before the game. Like many others I have been appalled and offended by a “movement” started by one NFL player. His claims of racial injustice in this country are valid and should be addressed. Like everyone in this country he has the right to free speech. I am not offended by his beliefs or desire to fight for injustice. I’m offended by his approach and actions. He hasn’t learned a very important lesson my dad taught me as a teenager. Not only is it okay to be a dissenting voice it is often the necessary. However, it is extremely important to do so in a manner that is appropriate and respectful of others.